The secure telephone line ringer was turned on at night and it jolted Blackie awake. He stumbled through the door in the false wall that hid the room that contained the secure line, a safe, and a lot of guns. Blackie tried to see the face of his watch to see what time it was as he muttered “hello” into the telephone. “A’right. Want us to call ya back tonight?” asked the Hulk. Blackie stood there with the phone in his hand reflecting…he was just getting back in circulation after an assassination attempt that left him in a coma for twenty-seven days. All his men and every snitch or person who knew Blackie were trying to get information on who the shooter was and who could have paid for the attempted hit. The rumors had cluttered the airways with stories about an old vendetta from a power struggle, a lone wolf nut, a beef over a broad from some jealous husband, nobody knew for sure yet what the real story was. With the Hulk and his partner having a potential informer, his goodies hooked up to a lamp cord, raised the possibility that they’d have the name soon. Blackie hung up the phone and headed back into his bedroom. His mind drifted to his girls. Lu, Al and Rae were home with him, Teri and Beth away at school. His heart sagged a little heavy as the thought crossed his mind, how would they have survived if the hit had been successful. Blackie, back to his six foot two, 235 frame, was ready to get on the street himself and search for the shooter, but he was smart enough to know this wasn’t a good idea yet. Uncle Paul, his sotto capo, had been handling everything just fine. Blackie sat on the edge of his bed and wondered to himself how Pop would handle this. His Pop had gone back to the old country from St. Louis after he had gotten out of prison when Blackie was in his early teens. Blackie and his sister had been sent to live with a close Family friend of his Pops. Now, twenty years later, he had worked his way up to lead his notorious crew of enforcers numbering over two hundred men. Their reputation for violence proceeded them, yet entire neighborhoods looked to them with respect, for he had solved local problems from a load of dirt in your yard that was sinking, to Aunt Molly’s gall bladder operation, broken down cars, out of work husbands and Junior’s scholarship thrown in, in between. In territories that they ran with an iron fist, there were no burglaries, robberies, speeders roaring through the neighborhoods, drunk drivers, spouse or children abusers, because when some of these things happened early during Blackie’s climb up the street ladder, he personally would track them down and…now teenagers knew better then to speed, men didn’t come home drunk and abuse their wives or children, and nobody was dumb enough to rob or burglarize any house or business. There were rumors abound that the punishment for some of these crimes could get your hand chopped off at the wrist and nobody wanted to test the enigma to find out. 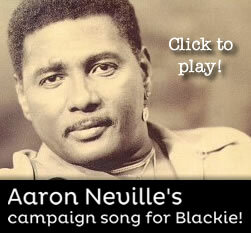 Blackie, born in the life, had not had an option. When his older brother Georgie had been killed in Korea while serving in the U S Marines Corp, Blackie, the next in line, was just that. He had done his stint in the Corps and had wavered a few times, being pushed by his Colonel telling him he had talent to change and to get out of the life. But when he got home, there was the ‘Family” business waiting. Maybe later when all the girls are grown, he’d do something the ‘white people’ called legitimate. Hell! What was he thinking! All the white people he knew would screw their mother out of a dollar. “What did ya get?” Blackie asked. Blackie rubbed his head and said to the Hulk, “Yall did good. Call it a night.” and hung up the phone, drug himself back to his bed, dropped on it, looked up at the ceiling and wondered will this circle of violence ever end? Will I ever have a peaceful life with my girls, will I find a good woman and live out my life on some bluff on the Mediterranean Sea? Why was someone always trying to get me and why was the vendetta so important to me? as he drifted off into a fitful sleep. Ready for the whole story? 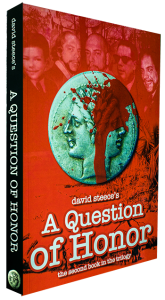 Order “David Steece’s A Question of Honor” today! It was an honor meeting you sir!! I am looking forward to reading your books! Loved the books. How are you doing? I graduated EBOLC and I am now trying to find employment. Despite the accomplishment of having your past recorded on paper, I sense that your “life journey” is far from over- You still have important & powerful things to do in your future- should you be willing. I look forward to hearing from you again. Best of luck on your book-tour! Just wanted to let you know that I got the picture all right, & that I like it very much. Now, if only i could print out the picture & have that signed, too! I enjoyed meeting you, & have loved “Paradox” so far. I can’t wait until I can afford to buy the next 2 books in the series. Good luck & good health to the both of you, & I wish you much success in the future! Let’s hope the movie is a blockbuster!!! Thank you both, I would love to meet you again in the future. 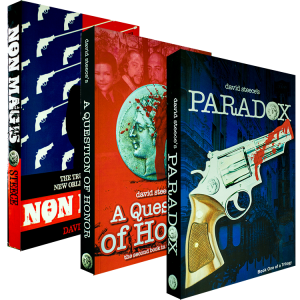 I love the book…chapter 16 of the Paradox! Blackie…what a crazy life you were balancing, Holy Cow! Will write more after I finish the book in the morning! I have a nephew who is a police of Cuyahoga Falls, Ohio. I will be up to have you sign two books for him…he will love these books! I remember your wife saying you will be here until the 25th, so it will be during the week that I will see you. You are an American Hero! Awesome 😉 I hate pics lol . We are the few the proud for sure 😉 Semper Fi . Can’t wait to read the books. Know my hubby will like reading them to . Thanks. I am enjoying them. Stay safe.